Selecting the correct fly fishing hook sizes can be confusing and complex when starting out. 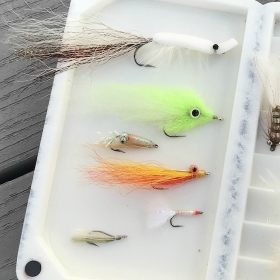 If you’re new to fly fishing, this article will cover some basic things to consider when choosing fly hook sizes. Hook sizes that are used for flies range from less than 1/8 of an inch in length for the smallest to 3 inches for the largest. In the smaller trout-sized hook, we use even numbers 2 through 28; the larger the number, the smaller the fly. Hooks larger than size 2 use a numbering system that increases as the size increases, using a slash/zero after the number to distinguish them. For small stream trout, smaller fly fishing hook sizes like a 6 or 10 may be sufficient. For medium-sized species such as salmon or redfish, you might use a size 4, 2 or 1/0. For larger species, you might try a 2/0 to 4/0. To create the most realistic presentation, your fly pattern should resemble something the fish wants to eat. This could be insect families like mayflies or nymphs, shrimp patterns or baitfish patterns that resemble minnows or finger mullet. In this case, the size of the hook is determined by the size of the fly. Use the smalles fly hook sizes needed for the job. Fish are smart and can sense if something seems off about a bait. Fly hooks tend to be mostly hidden by the fly material which helps disguise the hook from a wary fish. Murky or deeper water creates lower visibility for fish so a larger fly (and hook) may be necessary for the fish to see the bait. If the water is clear and shallow, use a smaller hook size. If the fish aren’t biting, switch it up until you find something they like. Try a smaller fly or larger fly and change up the colors. Learn about the anatomy of a hook to help you better understand the “why” behind it’s different parts. There are also different types of fly hooks for different patterns of flies. Fear not about the overwhelm of options; you’ll learn as you go which makes the challenge of fishing so rewarding!